2) Use a flat bottomed frying pan for frying the vadas. Heat oil on medium heat and when smoke emerges from the oil, give a spoonful of batter into the oil and fry the vada till it turns golden in colour. Vadas should be soft. Dont deep fry the vadas as then they will turn crispy and lose the softness. Further, vadas should float in the oil so that they get enough space to become fluffy. Dont use too much oil at once for frying. 3) Once the vadas are ready, you can store them in refrigerator for 20-30 days. Just when you feel like eating, take the vadas out. Dip them in hot water for about few minutes and then place them in water of normal temperature for 15-20 minutes. Afterwards placing the vadas between your palms, gently squeeze the water out. Be careful not to put too much pressure as that might break the vadas into pieces. If you are eating freshly cooked vadas, then put them in water of normal temperature only. 4) In a bowl mix ﻿two cups of yogurt with salt and make a batter of smooth consistency. 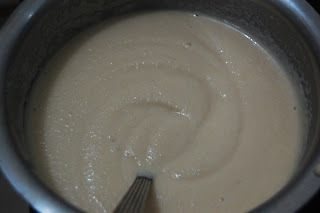 Add little milk if required to get the desired smoothness. Then soak the vadas in the yogurt batter for about 15 minutes. 5) Just before serving pick the vadas out one by one and arranged them on a plate. Pour the yogurt on each of the vadas and sprinkle some roasted powder, chilli powder and tamarind chutney. Dahi Vada is ready to serve.